Maestro Alex Gregory's Penta Orchestra: Another Millennium? Did That Telecaster Shrink, or Did Your Hand Grow? 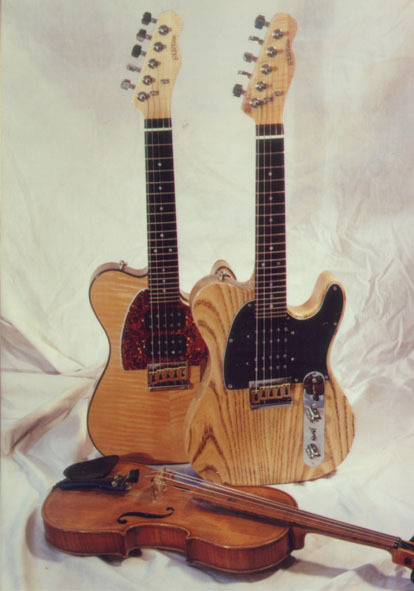 On the cover of the Michael Lampert album Jacaranda, there's a gorgeous-looking instrument that at first glance appears to be a Telecaster with a flame maple top. It's not; it's an electric mandolin! Kevin Schwab made this instrument. He works out of Hoffman Guitars, where he's been employed for the past nineteen years. When he isn't doing first-class repairs, he builds custom electric mandolins. Kevin's mandolins have been purchased by John Abercrombie, Joe Carr, Jimmy Henley, Peter Ostroushko, and Marty Stuart. Since these are all made-to-order instruments, everything is subject to the future owner's whims, but there are three specification levels. The basic model has two Lace sensor pickups mounted on an ash body with a natural finish top. The deluxe model has an alder body with a flamed maple top in natural or sunburst finish. A tortoiseshell binding circumnavigates the top. Finally there's the custom level that can be made using custom colors and special veneers like the tiger-stripe flame maple used on Michael Lampert's mandolin. Also, the custom model can have Bartolini humbucking pickups instead of Lace sensors. All models use a bolt-on flame maple neck with an ebony slab fingerboard, jumbo frets, and a very Fenderish headstock to give you something to wrap your hands around. Tuners are nickel-plated Schallers. Schwab's mandos are available in either four- or five-string versions. Kevin sent me a custom five-string for review. All his necks have a slightly longer than normal scale-length at 14.5". Schwab feels this added length aids the sustain. There's also a solid brass bridge plate and saddles to further increase sustain. The review sample had a mahogany body routed from the back to accommodate a Bartolini dual-sound mini-humbucker. This pickup is wired for series and parallel so you can change the tone via a mini-toggle switch. Volume and tone knobs are positioned on either side of the toggle. Schwab mandolins start at $1150 for the basic model, $1295 for the custom and go on up depending on the options. Kevin sent me a five-string version with a special flame koa top and two-ply top binding that goes for $1450. A rectangular hard case adds an extra $140 to the tab. I was very impressed with the fit and finish of this mandolin. In many ways this Schwab reminded me of my Tom Anderson Hollow-T. There's a overall feeling of attention to details that you don't find on a factory-made instrument. The careful finishing of the backplate cover, the way the string ferrules sit on the body, and the perfect setup show that this mandolin was built with care and precision. While a five-string electric mandolin is a mandolin, it is very different than an acoustic mandolin. Instead of pairs of strings, it has single strings. Because of this arrangement the strings are not as close together. The feel and sound of a Schwab is much closer to an electric guitar than a mandolin. Not only can you bend strings, but you get a sustain that you don't find on regular mandolins. Even not plugged in, when you hit a note cleanly it just hangs around forever. After about five minutes of playing time I abandoned Bill Monroe chops for Jimi Hendrix licks. With the Bartolini pickup, the Schwab mandolin sounds very warm, with a thick round tone that lends itself to jazz chord voicings and bluesy arpeggios. With the tone control in its most trebly position and the mini-toggle in series, the Schwab still has a tone that has more Gibson roundness than Fender twang. The Lace sensor pickup version is quite a bit more Fender-like. Most electric mandolins I've played in the past have been works in progress rather than real working instruments. Even vintage Fender solidbody electrics are often hard to play because of mediocre or bad setups. Also, most electric mandos suffer from hot spots and dead zones on the neck where their volume changes radically. Finally, intonation on electric mandolins is spotty at best. Often there is no way to get the upper neck to intonate properly, since the saddles can't move enough, if at all. The Schwab is an exception. Not only is the intonation spot-on, but the action is low with no buzzes, hot areas, or dead regions. Even way up the neck the tone is pure and clean. This is a real professional instrument, one that can be set up to play and sound right. After a couple of weeks with this mando I'm very reluctant to let it return to its home in Minnesota. It plays beautifully and sounds like nothing I've ever heard before. It encourages you to try new stuff as well as pick old stuff in a different way. If you play mandolin and want to be able to rock out, or play jazz in an amplified situation, a Schwab mandolin should be in your future. If you want to hear a Schwab mando from the comfort of your own computer chair, log into Sojourner Records, where you can hear some Michael Lampert cuts from Jacaranda. To contact Kevin Schwab, either call Hoffman Guitars at 612-338-1079, or e-mail him at kschwab812@aol.com. You can also check out some of his other mandolins at Hoffman Guitars.